La Mare Wine Estate covers 25 acres of land in the north west of Jersey, probably more than you thought possible on our small island. Tucked away in the beautiful country parish of St Mary, the estate is well worth a leisurely visit. Take a guided tour to discover the stunning grounds and gardens before tasting some of the estate’s traditional products such as cider and wine, as well as the more adventurous drinks like the new Vodka made from Jersey Royal Potatoes. Finish your visit by going to the lovely Cellar Door Shop where all things deliciously Jersey are sold, many of them with a Genuine Jersey sign of approval! Jersey’s cider production started back in the 15th century with a huge amount of the agricultural land dedicated to apple orchards. 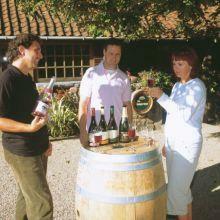 Wine making only started in 1972 when La Mare vineyards were planted. Since then the production line has rapidly expanded. Now on the menu are: red, white, rosé and sparkling wines, apple brandy, gin, vodka, and the lovely Pompette. The cognac style distillery is an impressive piece of machinery, one which you will be able to admire and see at work before tasting some of the locally produced apple brandy. La Mare’s success lies in its innovative spirit, which has led to the natural association of wine and food – always a winning combination. La Mare has its very own Chocolatier onsite, whose products can be found in many venues around the island and who organises chocolate making workshops, a very messy but very yummy activity! As well as chocolates, La Mare create fudges, biscuits and preserves within the grounds, all can be purchased in their onsite shop. Or maybe take your time in the Vineyard Restaurant for a morning coffee, a lunch break or an afternoon tea before heading towards new destinations. You can find all the vineyard’s products in Maison La Mare, their St Helier’s shop, a lovely showcase for Jersey’s home made delicacies. This entry was posted in Places to Visit and tagged La Mare Wine Estate. Bookmark the permalink.